by Kerby Anderson, Contributing Author: Recently conservatives concerned about an accurate view of American history won a victory at the College Board. 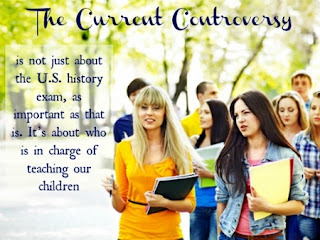 The College Board is a massive non-profit organization responsible for the Advanced Placement Exam as well as the SAT. The College Board is in the midst of revising the various AP tests. To understand the significance, consider that more than 2,600 colleges (including most Christian colleges) offer credit to students who do well on the AP exams. It also operates as a de facto monopoly by setting the agenda for the tests that are administered. The current guidelines are very different from the ones posted last year. Why? Many of the states began to push back against what some have called “neo-Marxist guidelines.” The College Board would lose lots of money and prestige if the states began to replace the tests with their own course material. The success in pushing back came in part because the liberal progressives pushed too far and too fast. Some conservatives argue that even the revisions are hostile to American ideals and ignore the positive impact of religion in America. But at least this is a small and significant victory for truth and teaching American history with an appreciation for the good as well as the bad chapters in our history. Tags: Kerby Anderson, Viewpoints, Point of View, College Board, AP Exams, SAT To share or post to your site, click on "Post Link". Please mention / link to the ARRA News Service. and "Like" Facebook Page - Thanks!